My google based map for gluten free places in Berlin is no longer updated, google simply does not have the tools to list and update them all properly. 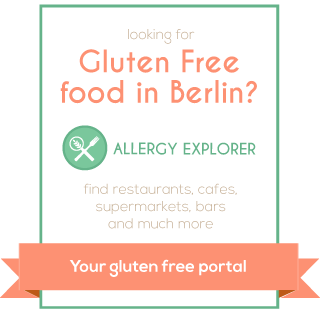 Everything is now up to date on the Allergy Explorer page for Berlin. Click the banner below to see it! Just wanted to say thanks for this site! I am from Australia and doing a 3 month. Europe and uk trip.i have celiacs disease and also am allergic to yeast-which happens to be in 90% of gluten free food! I went to a few of these places and is especially LOVED vitalia the health food shop,because they had so much bread I was able to find a couple I could have-after not eating any form of bread for a month I was sooo happy!! Also I found marengo steakhouse great they were really helpful and I finally got some iron and protein in me! I have now done a month on my trip and have been to 3 countries I do honestly recommend anyone who has more than just the gluten free allergy or even just celiacs get an apartment!!! Or u can get hotels with a kitchen, supermarkets are fine but I have found restaurants even with my translator cards a bit of a nightmare. I have honestly started doing packed lunches As well and cannot wait for the last 6 weeks of our trip when it is all apartments!!! Thanks so much for this site. Just arrived here and we are gluten intolerant so plan to check out some of your suggestions. Great site. Thanks! Also, I discovered a great Italian place in Prenzlauer Berg where all non-stuffed pastas can be ordered gluten-free: Pappa e Ciccia (Schwedter Straße 18 10435 Berlin). A bit expensive but delicious dishes! Dunno if you’ve ever heard of it, but wanted to let you know. Hi! Thanks, it’s always good to hear that the blog is useful 🙂 Thanks for the tip too, I’ll check it out, haven’t been to too many good gluten free Italian places here. this is great! Am coming to Berlin very soon so this will be a huge help! merci beaucoup. Am leaving for Berlin on Tuesday May 7 and am gluten intolerant. thank you thank you thank you! this is HUGE! I have been living in Berlin for 3 years and never once had a Pizza prepared by anyone else than myself. So excited to try your suggestions! This map saved my social life and my marriage (lol) I keep the link to your blog on my phone, and when I go out with my husband I checked it wherever I am to see where we can eat. Thank you, thank you and thank you! We are going in Berlin very soon and your website is just wonderful for me. Thank you so much for hosting this site – and for this map in particular! I am a celiac and will be visiting Berlin in a few short weeks and will definitely be using this to guide my restaurant choices! The cafe “Wahrhaft Nahrhaft” (Revalerstr. 16 in Friedrichshain) always has one gluten-free desert option, and they bake their own gluten-free bread, so you can have them put together any sandwich you want. Their selection fo fresh toppings is lovely. I love this place; it’s delicious and oh so fresh! That’s great, thanks for the tip! Thank you for your map, it was very helpful when I visit Berlin last Silvester. Dai Ragazzi Bar is no longer. I would tell it you because I was there and there was a new owner and they don’t serve gluten-free meals. I eat pizza at Simelea and it was really ok, no pain in my stomach. And I’m very sensitive… So maybe they changed something in their kitchen?! Oh, and the gluten-free cake at Princess Cheesecake was really good. 31th December was my birthday and eat the cake was a really good present for me :). Hiya, thanks, I’m really glad I could help! I didn’t know about Dai Ragazzi, that’s a real shame, the owners were rather different in their approach to service 🙂 Plus, their food was great. I’ll update the map! Thanks for the info. Check out Malatesta, I. Charlottenstrassse, near Gendarmenmarkt. Ask for the allergico menu, which identifies the trouble ingredients. Had a great risotto and sorbetto al limone. Great!. Friendly helpful service too. Great, thanks for the tip, I haven’t heard of them before. It’s a bakery – direkt an der U2 Eberswalder Str. This is going to be very helpful for my husband and I in our travels! Thank you. One question: What can we access in the way of alcohol? He likes ciders but prefers liquors but, we are afraid of the costs!